This article is about the American actress. For other people named Doris Day, see Doris Day (disambiguation). Day was usually one of the top ten singers between 1951 and 1966. [vague] As an actress, she became the biggest female film star in the early 1960s, and ranked sixth among the box office performers by 2012. In 2011, she released her 29th studio album, My Heart, which became a UK Top 10 album featuring new material. Among her awards, Day has received the Grammy Lifetime Achievement Award and a Legend Award from the Society of Singers. In 1960, she was nominated for the Academy Award for Best Actress, and in 1989 was given the Cecil B. DeMille Award for lifetime achievement in motion pictures. In 2004, she was awarded the Presidential Medal of Freedom by President George W. Bush followed in 2011 by the Los Angeles Film Critics Association's Career Achievement Award. She is one of the last surviving stars of the Golden Age of Hollywood. Doris Mary Ann Kappelhoff was born on April 3, 1922, in Cincinnati, Ohio, the daughter of Alma Sophia (née Welz; 1895–1976), a housewife, and William Joseph Kappelhoff (1892–1967), a music teacher and choir master. All of her grandparents were German immigrants. For most of her life, Day reportedly believed she had been born in 1924 and reported her age accordingly; it was not until her 95th birthday—when the Associated Press found her birth certificate, showing a 1922 date of birth���that she learned otherwise. Observing her daughter sing rekindled Alma's interest in show business, and she decided Doris should have singing lessons. She engaged a teacher, Grace Raine. After three lessons, Raine told Alma that young Doris had "tremendous potential"; Raine was so impressed that she gave Doris three lessons a week for the price of one. Years later, Day said that Raine had the biggest effect on her singing style and career. It was awful", Day told OK! Magazine in 1996. "I was really, really not very well when Marty [Melcher] passed away, and the thought of going into TV was overpowering. But he'd signed me up for a series. And then my son Terry [Melcher] took me walking in Beverly Hills and explained that it wasn't nearly the end of it. I had also been signed up for a bunch of TV specials, all without anyone ever asking me. Day hated the idea of performing on television, but felt obligated to do it. The first episode of The Doris Day Show aired on September 24, 1968, and, from 1968 to 1973, employed "Que Sera, Sera" as its theme song. Day persevered (she needed the work to help pay off her debts), but only after CBS ceded creative control to her and her son. The successful show enjoyed a five-year run, and functioned as a curtain raiser for the popular Carol Burnett Show. It is remembered today for its abrupt season-to-season changes in casting and premise. By the end of its run in 1973, public tastes had changed and her firmly established persona was regarded as passé. She largely retired from acting after The Doris Day Show, but did complete two television specials, The Doris Mary Anne Kappelhoff Special (1971) and Doris Day Today (1975). She appeared on the John Denver TV show in 1974. In October 1985, the California Supreme Court rejected Rosenthal's appeal of the multimillion-dollar judgment against him for legal malpractice, and upheld conclusions of a trial court and a Court of Appeal that Rosenthal acted improperly. In April 1986, the U.S. Supreme Court refused to review the lower court's judgment. In June 1987, Rosenthal filed a $30 million lawsuit against lawyers he claimed cheated him out of millions of dollars in real estate investments. He named Day as a co-defendant, describing her as an "unwilling, involuntary plaintiff whose consent cannot be obtained". Rosenthal claimed that millions of dollars Day lost were in real estate sold after Melcher died in 1968, in which Rosenthal asserted that the attorneys gave Day bad advice, telling her to sell, at a loss, three hotels, in Palo Alto, California, Dallas, Texas, and Atlanta, Georgia, plus some oil leases in Kentucky and Ohio. In a rare interview with The Hollywood Reporter on April 4, 2019, a day after her 97th birthday, Day talked about her work on The Doris Day Animal Foundation, founded in 1978. On the question of what her favorite film was, she answered Calamity Jane: "I was such a tomboy growing up, and she was such a fun character to play. Of course, the music was wonderful, too — 'Secret Love,' especially, is such a beautiful song." To commemorate her birthday, her fans gather each year to take part in a three-day party in her hometown of Carmel, California, in late March. The event is also a fundraiser for her Animal Foundation. In 2019, during the event, there was a special screening of her 1959 film Pillow Talk to celebrate its 60th anniversary. About the film Day stated in the same interview that she "had such fun working with my pal, Rock. We laughed our way through three films we made together and remained great friends. I miss him." ^ "About Doris – Doris Day". Dorisday.com. Retrieved July 22, 2018. ^ "Doris Day". Biography in Context. Detroit, MI: Gale. 2013. Retrieved January 15, 2016. ^ a b Hotchner, A.E. (1976). Doris Day: Her Own Story. New York: William Morrow and Company, Inc. ISBN 978-0-688-02968-5. ^ a b Elber, Lynn (April 2, 2017). "Birthday surprise for ageless Doris Day: She's actually 95". Associated Press. Archived from the original on April 4, 2017. Retrieved April 2, 2017. A copy of Day's birth certificate, obtained by The Associated Press from Ohio's Office of Vital Statistics, settles the issue: Doris Mary Kappelhoff, her pre-fame name, was born on April 3, 1922, making her 96. Her parents were Alma and William Kappelhoff of Cincinnati. ^ a b Browne, Ray Broadus; Browne, Pat (2001). The Guide to United States Popular Culture. Popular Press. pp. 220–221. ISBN 978-0-87972-821-2. Retrieved August 8, 2013. ^ Sutro, Dirk (2011). Jazz For Dummies. John Wiley & Sons. p. 112. ISBN 978-1-118-06852-6. Retrieved August 8, 2013. ^ Santopietro, Tom (2008). Considering Doris Day. St. Martin's Press. p. 22. ISBN 978-1-4299-3751-1. Retrieved August 8, 2013. ^ Whitburn, Joel (1986). Joel Whitburn's Pop Memories 1890–1954. Wisconsin: Record Research Inc. p. 63. ISBN 978-0-89820-083-6. ^ Terenzio, Maurice; MacGillivray, Scott; Okuda, Ted (1991). The Soundies Distributing Corporation of America: a history and filmography of their "jukebox" musical films of the 1940s. McFarland & Co. pp. 33–35. ISBN 978-0-89950-578-7. Retrieved August 9, 2013. ^ Gentry, Philip Max (2008). 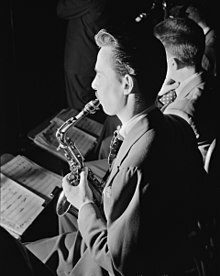 The Age of Anxiety: Music, Politics, and McCarthyism, 1948–1954. ProQuest. p. 104. ISBN 978-0-549-90073-3. Retrieved August 8, 2013. ^ "Michael Curtiz Services Set". The Tennessean. Associated Press. April 12, 1962. p. 58. Retrieved April 4, 2017 – via Newspapers.com. ^ Whitburn, Joel (1986). Joel Whitburn's Pop Memories 1890–1954. Wisconsin: Record Research Inc. p. 122. ISBN 978-0-89820-083-6. 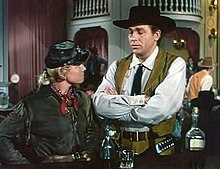 ^ "Doris Day Learned How to Flick Bull Whip for Tough Western Role in 'Calamity Jane'". The Brooklyn Daily Eagle. November 8, 1953. p. 31. Retrieved June 26, 2018 – via Newspapers.com. ^ Palmer, R. Barton (2010). Larger Than Life: Movie Stars of the 1950s. Rutgers University Press. p. 154. ISBN 978-0-8135-4994-1. Retrieved August 9, 2013. ^ Dunning, John (1998). On the Air: The Encyclopedia of Old-Time Radio (Revised ed.). New York: Oxford University Press. p. 207. ISBN 978-0-19-507678-3. ^ Lisanti, Tom; Paul, Louis (2002). Film Fatales: Women in Espionage Films and Television, 1962–1973. McFarland. p. 104. ISBN 978-0-7864-1194-8. Retrieved August 8, 2013. ^ "Best Selling Popular Albums". Billboard: 94. November 12, 1955. Retrieved April 3, 2017. ^ Tyler, Don (2008). Music of the Postwar Era. ABC-CLIO. pp. 113–14. ISBN 978-0-313-34191-5. Retrieved August 8, 2013. ^ "Doris Day Due Tonight for Premiere". The Cincinnati Enquirer. October 7, 1956. Retrieved June 26, 2018 – via Newspapers.com. ^ "The Films of Doris Day: recordings". 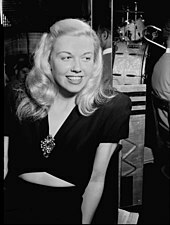 Dorisday.net. ^ Glitre, Kathrina (2006). Hollywood Romantic Comedy: States of the Union, 1934–1965. Manchester University Press. p. 159. ISBN 978-0-7190-7079-2. Retrieved August 9, 2013. ^ Pilchak, Angela (2005). Contemporary Musicians: Profiles of the People in Music. Gale. p. 133. ISBN 9780787680664. Retrieved August 9, 2013. ^ Waller, Gregory Albert (1987). American Horrors: Essays on the Modern American Horror Film. University of Illinois Press. p. 166. ISBN 978-0-252-01448-2. Retrieved August 8, 2013. ^ Grindon, Leger (2011). The Hollywood Romantic Comedy: Conventions, History and Controversies. John Wiley & Sons. p. 87. ISBN 978-1-4443-9595-2. Retrieved August 8, 2013. ^ Sonneborn, Liz (2002). A to Z of American Women in the Performing Arts. Infobase Publishing. p. 52. ISBN 978-1-4381-0790-5. Retrieved August 8, 2013. ^ "The Doris Mary Anne Kappelhoff Special". IMDb.com. Retrieved April 17, 2019. ^ "Doris Day Today". IMDb.com. Retrieved April 17, 2019. ^ "The John Denver Show". IMDb.com. Retrieved April 17, 2019. ^ Oberman, Tracy-Ann (October 16, 2012). "Rock and Doris and Elizabeth: a moment that changed Hollywood". The Guardian. London. Retrieved July 4, 2013. ^ Grace, Roger M. (October 1, 2007). "'Uncle Jerry' – Jerome B. Rosenthal – Is Dead". Metropolitan News-Enterprise. Retrieved August 19, 2012. ^ "Cut keeps Doris Day from Academy Awards". The Republic. Associated Press. March 30, 1989. p. A2. Retrieved April 4, 2017 – via Newspapers.com. ^ Smith, Liz (November 27, 2011). "Let's Give Doris Day An Award". ThirdAge. Archived from the original on November 12, 2013. Retrieved August 8, 2013. When, oh when, will Doris receive her long-overdue honorary Academy Award? ^ Cody, Antony (September 1, 2011). "Doris Day releases first album in 17 years". The Daily Telegraph. Retrieved May 18, 2017. ^ Elber, Lynn (November 29, 2011). "Doris Day sings out for 1st time in 17 years". Pittsburgh Post-Gazette. Associated Press. Retrieved May 18, 2017. ^ Cooper, Leonie (August 15, 2011). "87 year-old Doris Day to release new album". NME. Retrieved May 18, 2017. ^ "Doris Day makes UK chart history". BBC News. September 11, 2011. Retrieved April 4, 2012. ^ McNeil, Liz (April 9, 2014). "Doris Day Makes Her First Public Appearance in More Than 2 Decades". People. Retrieved June 26, 2018. ^ Lee, Benjamin (September 22, 2015). "Doris Day reportedly lured out of retirement by Clint Eastwood". The Guardian. Retrieved June 26, 2018. ^ "Doris Day: not quite the girl next door". Irish Independent. April 3, 2016. Retrieved June 26, 2018. ^ "Doris Day Shares Never-Before-Seen Photo for 92nd Birthday". ABC News. April 5, 2016. Retrieved May 18, 2017. ^ Cartwright, Garth (November 23, 2004). "Terry Melcher". The Guardian. Retrieved August 30, 2018. ^ "Doris Day: Why she left Hollywood". CBS News. July 14, 2008. Retrieved June 26, 2018. ^ a b c "Doris Day Fast Facts". CNN. March 20, 2018. Retrieved June 26, 2018. ^ Grudens, Richard (2001). Sally Bennett's Magic Moments. Celebrity Profiles Publishing. p. 115. ISBN 978-1-57579-181-4. Retrieved August 8, 2013. ^ Patrick-Goudreau, Colleen (2011). Vegan's Daily Companion: 365 Days of Inspiration for Cooking, Eating, and Living Compassionately. Quarry Books. p. 49. ISBN 978-1-61058-015-1. Retrieved August 8, 2013. ^ Di Paola, Mike (March 30, 2011). "Doris Day Center Gives Abused Horses Sanctuary with Elands, Emu". bloomberg.com. Archived from the original on September 24, 2015. Retrieved August 3, 2013. ^ "Doris Day, 93 from 12 Celebrities Age 90 or More and What They Love to Eat Slideshow". The Daily Meal. Retrieved April 17, 2019. Christmas message from Doris Day – The Oklahoman, accessed March, 2019.